Published in the February/March 2016 issue of The IAPD Magazine. 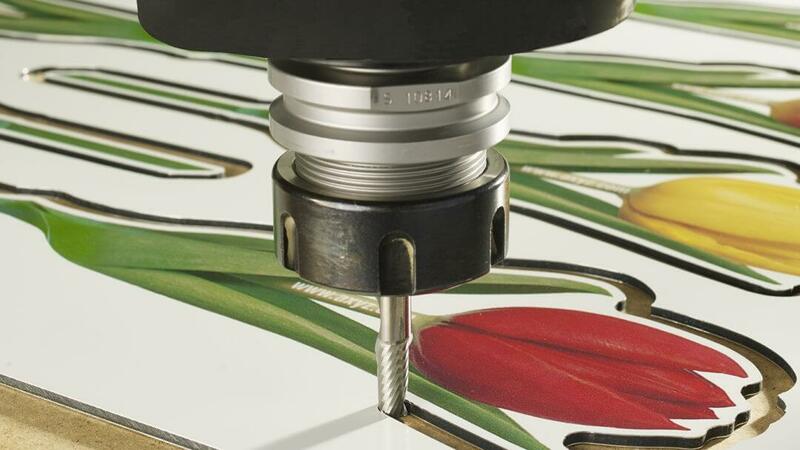 The Digital Finishing industry has always faced challenges when working with acrylics and other plastics. In most cases, the printed material had to be created on one substrate and eventually transferred to a plastic or other substrate that required separate cutting tools—a process that consumes too many valuable resources including time, labor and money. Fortunately, printing capabilities have greatly improved thanks to the growth of UV technology, but they have not completely expedited the process. That’s because traditional print finishing tables are designed more for cutting lightweight materials such as vinyl. Acrylics and other hard plastics require a different cutting technology than the usual knife blade. Today, advances in technology include high speed processing that enables both plastics and lightweight material cutting. Instead of using separate finishing tables, the process has evolved with the development of hybrid CNC routers that include larger routing spindles with tangential and oscillating knives. Technological enhancements in digital finishing have kept pace with improvements in the printing process. The most notable for the latter is ultraviolet printing in which UV inks have, for the most part, replaced the traditional solvent-based inks. Solvents were not viewed as environmentally friendly. In addition, printers had to wait for the ink to dry making the process unacceptably lengthy. With UV, the ink is cured as it is printed by lamps mounted on the print head. With the right inks and print settings, it is possible to print on a wide range of substrates including woods, metals and all types of plastic sheet products. Ink and material manufacturers further enhanced the process by developing new products, which provide greater adhesion and durability. All well and good, but one major problem remained—the cutting of the substrate. All too often, cutting required different knives and other tools depending on the type and thickness of the substrate. This, too, could be time consuming and expensive depending on the tools and the machines available. Many finishing machines were limited to paper or vinyl cutting so plastic cutting was beyond their capacity or capability. The traditional knife blade, perfectly fine for lightweight material cutting, was rendered useless for acrylic or other plastics. Knives were not the only limitation in the lightweight finishing process. Routing spindles had to be heavier along with rotating tools. In fact, the entire finishing machine including base, work-holding system, gantry and tooling had to be strengthened if it was to provide a better and more practical cutting option. These were just some of the problems technology had to solve. Another obvious issue was registration in which cameras identify the precise location and track of the cutting. To some extent, technologies in which cameras locate marks for the finishing machine, which can modify the program to cut in exactly the right place, has been used. So why is this not enough for today’s digital print finishing? The answer is similar to the circumstances with the traditional knife. The types of cutting tools for commonly used finishing machines are limited, and the user will most likely have to use a different cutting device to finish the project. AXYZ’s response has been to create a finishing process resolving the cutting tool dilemma: An innovative CNC cutting solution, the Trident Series. There are several notable differences between the hybrids and conventional finishing machines. First, the hybrid has been modified to handle heavier substrates as well as lightweight materials. Perhaps the most significant difference is the development of multi-functional knife units and a powerful routing spindle. These changes ensure that printing on a rigid substrate such as acrylic can be accomplished by one type of finishing process that is equally capable of handling broader projects. The components of the hybrid can be described as a three-head configuration: the routing spindle, an oscillating knife and a tangential knife. The capabilities of all three are numerous. Start with the routing spindle, which is fitted with conventional router bits and generally used for cutting rigid substrates such as plastics and metals. Routing spindles come with a variety of power ratings; e.g. 5 HP and 10 HP. Usually, their speeds tend to run at either 18,000 rpm or 24,000 rpm, but some can go as high as 40,000 rpm. There is a wide variety of choices of router bits and it is obviously important to select the bit that is most appropriate and applicable for the material that is about to be processed. The oscillating knife in the hybrid is considerably different than a conventional drag knife. The latter turns on its own axis to align itself with the contour to be cut and is limited to lightweight materials such as vinyl or paper. The oscillating knife oscillates its blade vertically by only a few millimeters, but at high frequency. The oscillating knife tends to be more suitable for soft and/or flexible materials such as corrugated plastic. It is apt to saw rather than drag its way through the material and does not fray it. Unlike the oscillating knife, the tangential knife has a fixed blade. Like its oscillating counterpart, however, it is powered by a motor to turn the blade in the direction of the cut. The tangential knife’s best use is for materials that are heavier, thicker or harder than the traditional drag knife can accommodate. Both oscillating and tangential knives have a varied selection of blades that are fitted with different geometries designed to suit different materials. Multi-functional knife units do more than allow the user to cut either light or heavy materials. They also increase throughput by eliminating the necessity for different machines depending upon the nature of the substrate. Bill Stender, founder and owner of San Francisco Landmark Signs, can attest to the impact hybrids have had on his finishing process. “For my shop, I wanted the capability of cutting half-inch or one-inch acrylic, which I could do previously, but it took too much time because the spindle I had was designed for lightweight cutting,” Stender said. After studying the options, he selected a multi-functional hybrid. “It’s got a heavy spindle, more horsepower and a very rugged frame, so we can cut heavy material without any issues,” he said. As Stender’s experience demonstrates, the technology is there to be leveraged, but unlike his example, many finishers aren’t taking advantage of it. It makes little economic sense to operate separate finishing machines limited to a specific cutting tool, yet that seems to be all-too-common in the industry. To compete in this environment, graphic industry finishers have to be able to work faster and offer more flexible and intricate cutting particularly in their use of acrylics. Hybrid technology has been designed to respond to these growing needs. Today’s computer numerically controlled routers and their robust knife attachments can accurately cut the harder substrates along with thin and flexible materials. The purpose of such digital finishing machines is to expedite the process, reduce costs long-term and ease time constraints for completion—worthy goals for every business. AXYZ is a leading global manufacturer of CNC Router and CNC Knife Systems, and maintains application development centers in the United States, Canada, the United Kingdom, Poland and India. Tel: (800) 361-3408.